What Day Of The Week Was September 19, 1990? 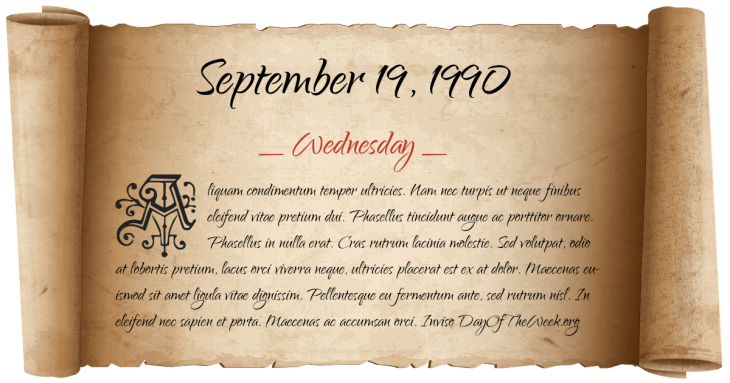 September 19, 1990 was the 262nd day of the year 1990 in the Gregorian calendar. There were 103 days remaining until the end of the year. The day of the week was Wednesday. A person born on this day will be 28 years old today. If that same person saved a Half dollar every day starting at age 5, then by now that person has accumulated $4,310.00 today. Delhi University student Rajiv Goswami attempts Self Immolation during Anti-Reservation agitation in India. Though he survived, his Self Immolation inspired nearly 150 self immolation bids and indirectly led to the Resignation of V P Singh Govt. Who were born on September 19, 1990?